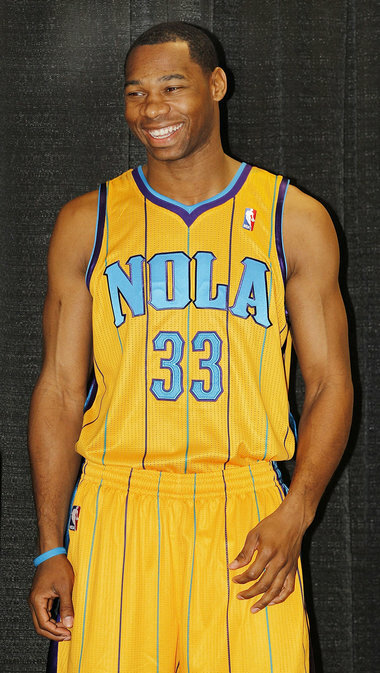 With all of the logo and uniform modifications this season it somehow only seems fitting that the New Orleans Hornets get in on the act. Especially when you consider the Utah Jazz kinda went back to their old Jazz uniforms that came on the scene first in New Orleans. Key reserve Willie Green introduces the Mardi Gra uniforms of the New Orleans Hornets. The new threads will make their debut next month. That Creole Blue fits well with the gold and the NOLA is hot on the front. What do you think are these the best Mardi Gra threads for the Hornets to date?